Although it’s been around for many years, the technique of cooking food sous vide (under vacuum) in a carefully temperature-controlled water bath has mainly been the preserve of chefs. Professionals have long appreciated the accuracy, consistency and sheer ease of a method that allows them to do the prep and (most of) the cooking of many dishes in advance. For example, they can portion, pack and cook steaks ahead of service, leave them in the water until needed, then quickly finish in a very hot pan to create an appealing brown crust, confident that the interiors will be cooked exactly as expected. More recently, as the line between professional and domestic kitchens blurs, home cooks are investigating sous vide too. Food historians attribute the idea of cooking under vacuum to Sir Benjamin Thompson, an 18th and 19th century physicist and inventor. Although he invented many items including a double boiler, an insulated drip coffee percolator and a new design of fireplace, he never actually created a sous vide machine, but he did document the idea of cooking under vacuum back in 1799, albeit using air as the heat transfer medium rather than water. In a related development, the French navy prompted Parisian confectioner and chef Nicolas Appert to develop an industrially viable canning process in response to their competition, launched in 1795, seeking new methods of preserving food. Appert observed that food cooked inside a jar did not spoil unless the seal leaked. Boiling the jars in water killed harmful bacteria and yeasts; it also created a vacuum seal that kept jars airtight and stopped recontamination. After almost 15 years of work, the process he submitted won him a substantial 12,000 francs prize. Later, the method was applied to food sealed in tin cans, hence the process became known as canning. Modern sous vide has been around since the 1960s, when French and American engineers mastered the process of making food-grade plastic films and pouches. Ingredients could be vacuum-sealed at sufficiently high pressures to compact textures and concentrate flavours. Sealing into such plastic is sometimes referred to as cryovacking after American company Cryovac Inc.
French chef Georges Pralus made the leap to using a sous vide water bath as a cooking technique when he was asked in 1974 by 3-Michelin-starred chef Pierre Troisgros to help find a way of cooking foie gras without losing so much of its weight during cooking. The foie gras, vacuum-sealed in food-grade plastic and cooked at a consistently applied specific temperature, not only loss far less fat during cooking, but had a more even texture too. The technique spread quickly and is now a common tool of many professional chefs. Since then, there has been much more research and documentation of the effects of different cooking temperatures and times on different foods, with particular attention to food safety and food preservation. A pioneer in the food science of sous vide cooking is Bruno Goussault who presented a study on this very topic back in 1974. He and Pralus both went on to provide professional training in the technique for top chefs from around the world. How Does it Work and What’s the Point? Detractors often dismiss sous vide as nothing more than boil-in-the-bag in an attempt to associate it with those dreadful ready-made dinners of decades ago. Of course, there’s more to it than that: for sous vide cooking, raw food is vacuum-sealed in the bag – the removal of air allows heat to be transferred by the water outside the bag directly to the food inside, far more efficiently than when air gets in the way. The cooking temperature is far lower than boiling; accuracy of temperature is critical. Boil-in-the-bag food has already been cooked and pasteurised (at high heat) so the consumer is simply reheating by immersing in boiling water. 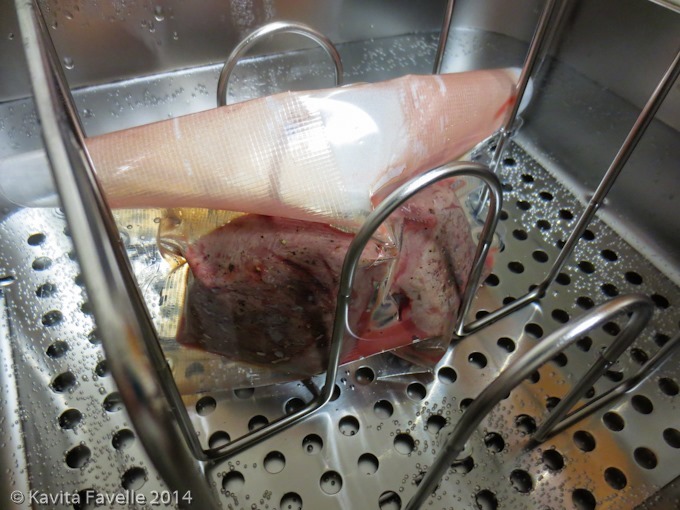 Sous vide cooking involves cooking in a bag, in water, but it’s definitely not boil-in-the-bag! When cooking food in a conventional oven (or in a pan on the stove top) the usual method is to set the temperature to high (we typically bake things at about 180 C) and leave the food in the oven (or on the stove) until it reaches the required internal temperature to transform from raw to cooked. The internal temperature the food needs to reach is far less than 180 C so the risk is that leaving the food cooking too long results in a continual rise in temperature, to the extent that the food becomes dried out or burnt. Of course, it’s also possible to underestimate the time needed, and remove a large item such as a roasting joint too soon, when it’s still raw at its centre. Temperature probes can help with this, but the cook still needs to ensure that the food is taken out at just the right time. Experience makes that less hit and miss, as does a temperature probe, but it’s still not an exact science given the different size and shape and moisture content of ingredients. When cooking sous vide, the temperature of the water bath is set according to the internal temperature required to transform the food from raw to cooked. Of course, it’s still possible to remove the food too quickly, before the heat has transferred to the centre of the food. But the converse is not a problem – leaving the food in the water bath for longer doesn’t cause it to overcook, as it cannot become any hotter than the temperature of the water itself. This can benefit the home cook as much as the professional, as it allows the cooked food to be left in the water bath until such time as other elements of the dish are ready, or diners are ready to eat. The accuracy of temperature achievable in a water bath means that meat can be cooked at precisely the right temperature to allow tough collagen to break down into soft gelatin, whilst avoiding the higher heats that denature protein and can make it tough. Choosing the right temperature allows the cook to target their preferred finish, whether that’s rare, medium rare, medium… Additionally, all the moisture is retained in the meat as it can neither evaporate nor drain away during cooking. When cooking fish such as salmon in a frying pan, it can be hard to apply heat evenly enough that the outer edges do not dry out before the centre is done, especially as this is a fish that is so good when it’s a touch under- rather than over-cooked. Using lower temperatures makes it easy to cook salmon evenly all the way through, and also avoid the unpleasant streaks of dried white albumen that are excreted when cooking fish at higher temperatures. There is less advantage over traditional methods when cooking vegetables, however adherents appreciate the intensity of flavours that cooking sous vide achieves. Lastly, vacuum sealing the food means it can be stored (sealed and refrigerated) for longer after cooking, protected against oxidisation. The advantage of cooking, say, a steak or joint of meat in a hot oven or pan is that the exterior develops a caramelised brown crust, as the sugars and amino acids react to high heat – the Maillard reaction, as it’s known. And we love it – a beautifully seared chop with a tender, pink interior is surely the epitome of meat cooking! 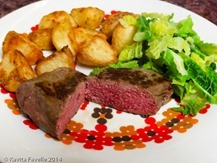 Sous vide cannot achieve this, because the entire piece of meat, from exterior through to the centre, is heated only to the temperature needed to take it to medium rare, for example. So, a sous vide steak really needs to be finished briefly in a very hot pan, to sear the exterior and give us the crusted appearance, texture and taste we yearn for. That’s not an issue with all ingredients – salmon fillets are beautiful served straight out of the sous vide, evenly cooked all the way through. And foie gras, the ingredient that inspired the development of the modern technique, needs only to chill in the fridge before it’s sliced, plated and served. Another issue to keep in mind is that of food safety, particularly for those with compromised immunity. The bacteria that is commonly found in food can be categorised into three groups – pathogens (which are harmful to us), spoilage (which, as the name implies spoil the taste and texture of food but are not, on their own, harmful to us) and friendly (which confer health benefits). Pathogens such as Clostridium botulinum (which produces the deadly toxin that causes botulism), Clostridium perfringens (one of the most common causes of food poisoning), Salmonella and Listeria monocytogenes are all capable of growing in a vacuum. They can be eradicated by the application of minimum temperatures for sustained periods. Of course, for some ingredients, the temperature required to achieve a desirable texture in the food is not high enough to destroy any pathogens. In this case, it’s crucial to consider the source and quality of the raw ingredients and to observe strict hygiene practices. 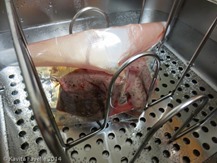 If storing food after sous vide cooking, it’s also advisable to reduce the temperature quickly, by immersing the sealed pouch into an iced water bath. Read more from sous vide expert Douglas Baldwin, here. There are a number of brands that sell sous vide equipment to commercial kitchens. These are generally too expensive, and potentially too bulky, to be of interest to, or in the financial reach of, home cooks. Many have resorted to jury-rigging contraptions using digital thermometers and rice or slow cookers. Some even manage with the tap, a kettle and an insulated cool box! And a few have even attempted sous vide cooking on the stove top, necessitating constant addition of hot or cold water and minor adjustments of the heat level, to maintain the required temperature. But for home cooks with a serious interest in the technique, and the budget to afford it, appliances aimed at the domestic market are now available. 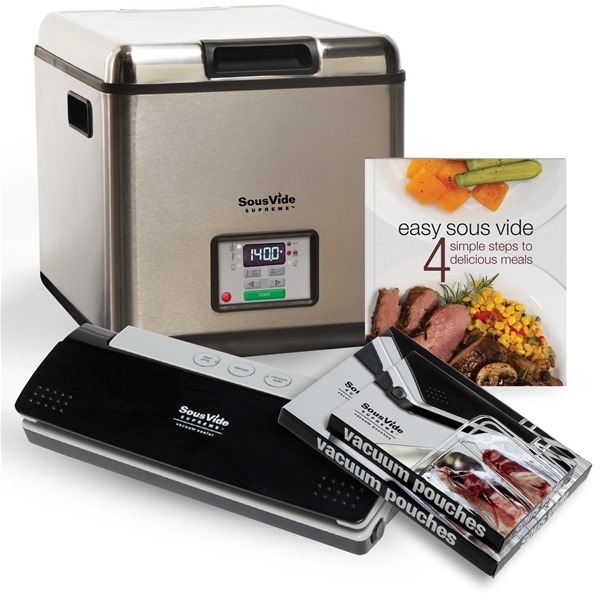 One such brand is SousVide Supreme, founded by Doctors Michael and Mary Dan Eades. They were motivated to investigate the technique after enjoying a particularly excellent pork chop served by a Las Vegas hotel’s room service team, during a visit to attend a medical conference. The nutritionist couple promote a high-protein, low-carbohydrate diet and also have a background in the restaurant trade, so when they realised there was a gap in the domestic market, they resolved to jump in and launched their domestic sous vide products in 2009. Their range includes two vacuum sealer machines, two (different sizes of) sous vide water ovens and accessories including plastic pouches and cookery books. The SousVide Supreme Water Oven is currently available on Amazon for £354, the Vacuum Sealer is currently £99. Alternatively, a Promo Pack of water oven, vacuum sealer, basic sous vide cookery book and 50 vacuum pouches is currently £450. Our SousVide Supreme equipment arrived shortly before Christmas and we’ve had it out a few times already since then. 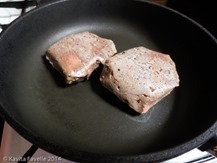 Thus far, Pete and I have made a foie gras terrine (our first project, in deference to the role of Georges Pralus) and we’ve cooked steak (plain) and chicken (with flavourings). We’ve been very pleased with how all three came out and we found the vacuum sealer and water oven very straightforward to use. I’ll be sharing some recipes and feedback with you going forward. Do take note that the oven is large, and needs some strength to lift when full of water. Kavey Eats received a SousVide Supreme Promo Pack in exchange for sharing four posts about SousVide Supreme and my experiences with the equipment. This is the first such post with more to follow in coming months. As usual, I will be 100% honest about my opinions, whether good or bad. 15 Comments to "What’s This Sous Vide Cooking All About?" We have the larger one. I do not think I could move it when full of water, but Pete finds it much easier, but he’s taller and stronger than me! Weighty and large but so easy to use! 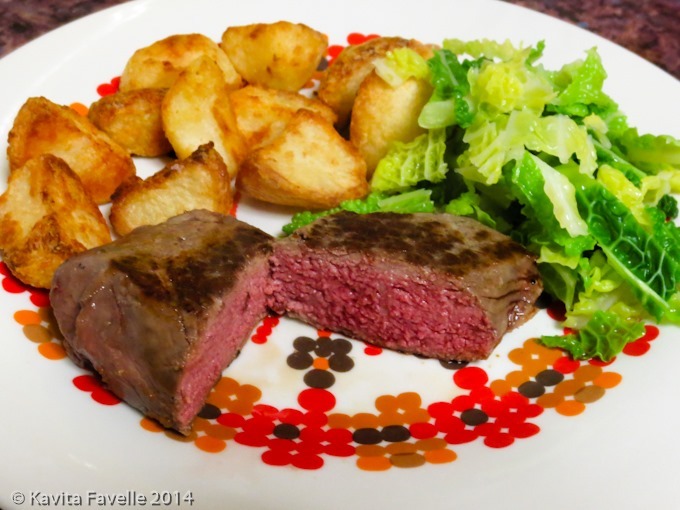 I really enjoyed reading through your post and finding out more about sous vide cooking. I’m always seeing it on tv on shows like Masterchef and would be curious to try it. I can’t imagine doing it at home though. I’ve been contemplating getting a sous-vide machine, but they’re all quite pricey, and like you say, the footprint isn’t small, and I’m not sure where I’d put it… But perfectly cooked food is highly enticing! By my reckoning, that makes at least 3 large temperature controlled water boilers you now have that you don’t have room for! Storage is always the issue with us, as you know! Pasteurised whole egg, tenderest pork chop, and perfectly poached foie gras – just some of the things one would not manage to easily do without a sous vide. If storage space and price were not issues, then the sous vide would indeed be a wonderful thing to have. Cooking eggs is definitely on my “to do” list as I love a soft soft yolk and white. The foie gras came out very well, but more importantly, it was simpler than the oven cooking followed by pressing into a terrine dish that we tried previously. A great post Kavey! Glad to see you’re enjoying your machine 🙂 I’ve had mine for just oover a year and I do live it. Have cooked a Flintstone sized ribeye steak in it that was God’s Own Steak, and love oxtail in it too. Look forward to your egg experiments – I found those the most interesting and the thing that needed the most trial and error to get right! Thanks for explaining sous vide. I’ve heard a lot about it, but never really understood what it was or what the point of it was.